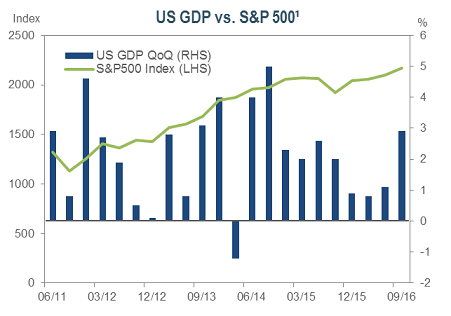 The US economy has expanded at a steady pace this year, continuing a period of modest growth in the wake of the financial crisis. While the domestic trend has remained positive, the challenging global economic climate has raised questions regarding the longevity of this expansion. 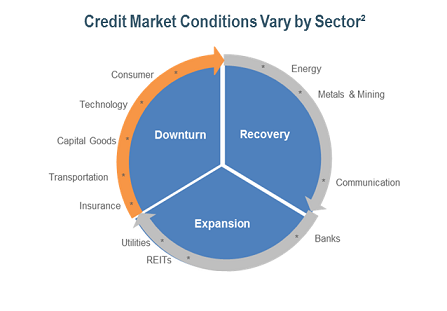 As we approach a potential inflection point in the credit cycle, we believe that it is imperative to closely monitor the health of corporate credit fundamentals. Although we have begun to see modest credit deterioration this year, our outlook for corporate sectors remains positive. Additionally, the technical environment has supported investor sentiment as low global rates and a strong dollar drive robust foreign demand for US debt. As outlined below, we believe that the evolving corporate market presents security selection and sector rotation opportunities that may deliver excess return for our clients. Accommodative monetary policy and positive economic data have provided a stable backdrop for the US corporate fixed income market in 2016. While many economies abroad have weakened, US GDP continues to grow, albeit at a slow pace, hovering around 2% year-over-year in the period following the financial crisis.¹ Labor market trends remain positive, with jobs growth averaging over 180,000 per month, and unemployment at about 5%.¹ Wage growth has also strengthened, helping to support consumer activity. Consumers are steadily increasing spending, while confidence levels suggest buying will continue to grow at a moderate pace. The real estate market continues to improve, with home prices rising 5% this year amid increasing demand.¹ All the while, inflationary pressures have remained at bay, providing a positive tailwind for businesses and individuals. Uncertainty surrounding the recent presidential election and the weak economic climate abroad are some of the factors driving concerns that the expansion may be fading. Since 1945, there have been 11 complete business cycles with an average expansionary period of five years.³ The current economic expansion has lasted over seven years; however, the strength of the recovery has been weaker than in previous cycles.³ While we see no immediate cause for concern, there are some early indicators that suggest that the economy is shifting toward late cycle dynamics. As illustrated in the diagram on the right, the majority of corporate sectors are beginning to show possible signs of deterioration. Despite these indications, we believe that recession risk remains low in the current environment. We are also seeing that within corporate sectors, industries are in different parts of the cycle, making it difficult to broadly characterize the entire market. For instance, the weak oil market in 2015 forced many energy companies to begin shoring up their balance sheets. 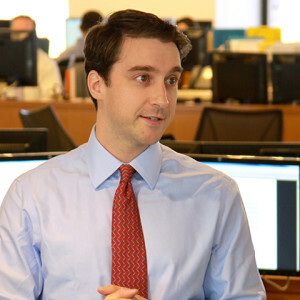 As a result, we believe that these companies have already entered the recovery phase. Meanwhile, late cycle indicators, such as falling profit margins and heightened shareholder returns, are rising in the technology and consumer sectors. Offsetting factors include President-elect Donald Trump’s proposal to lower corporate taxes and reduce regulation, which could accelerate the fundamental recovery. Increasing leverage, which is generally an indicator of deteriorating credit quality, is the primary watch-out in the current market. While we are monitoring this trend closely, we are not overly concerned. 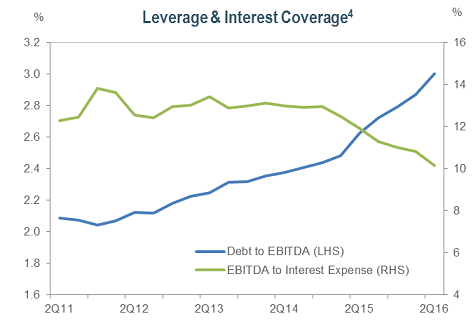 Companies are still meeting their debt obligations comfortably, with interest coverage around 10x.4 Additionally, a recovery in earnings growth and a reduction in M&A could reverse the leveraging trend relatively quickly. Overall, the corporate earnings outlook appears healthy as the market anticipates that economic growth could pick up under the Trump Administration. 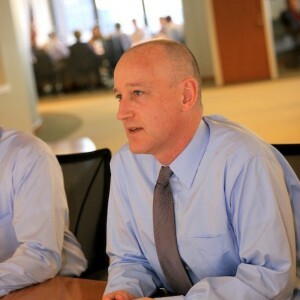 We will closely monitor the health of corporate fundamentals to best forecast these trends and to take advantage of opportunities that arise throughout the credit cycle. Amid the stable fundamental backdrop, strong demand for US credit has driven spreads tighter year-to-date in the face of heavy issuance. Following the election, corporate spreads touched a low of 129bps, 36bps tighter year-to-date.¹ Investment-grade supply has topped the $1 trillion mark, placing 2016 on pace to be a record-setting year.4 In this low rate environment, traditional high-quality US buyers are pushing into lower-quality credits in search of additional yield. Outside the US, over a quarter of all government debt is trading in negative territory.¹ The lack of attractive opportunities in local foreign markets is driving strong flows into US corporate bonds. 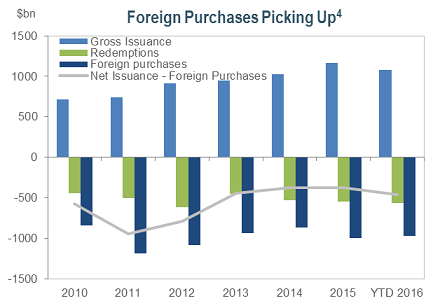 Historically, foreign buyers have focused their US investments in the Treasury and Agency markets. More recently, they are increasingly finding attractive opportunities in investment-grade corporates, which have boosted returns. Additionally, corporate buying programs in the Eurozone and Japan are providing a positive technical for high-quality bonds, even in the US. 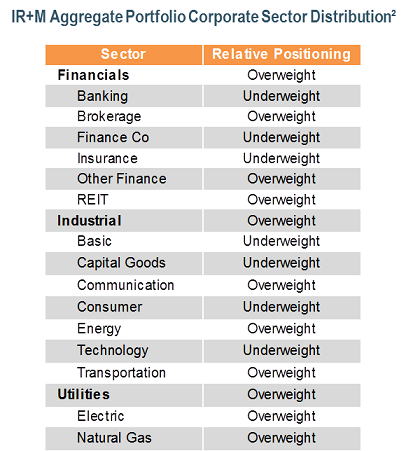 At IR+M, we believe that the current cycle has the potential to persist and remain overweight the corporate sector across our portfolios. However, we believe our exposure is well diversified across sub-sectors as some pockets of the market are beginning to show late-cycle dynamics.  In this environment, we believe active management is key, as it allows us to underweight sub-sectors that may be entering the deterioration phase. Specifically, within investment-grade corporates, we are closely monitoring the more cyclical industries, such as consumer and technology, and currently hold an underweight to these sub-sectors. Simultaneously, we are carefully monitoring these underweights, seeking an attractive buying opportunity if spreads widen. 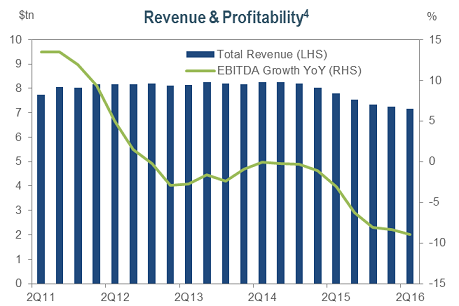 We continue to favor subsectors with stable, predictable cash flows and regulatory oversight, such as financials and utilities. At IR+M, we believe bottom-up fundamental analysis and active security selection can provide superior long-term results as we begin to see signs of late-cycle dynamics in the investment-grade corporate bond market. 1Bloomberg Barclays as of 9/30/16. 2IR+M as of 9/30/16. ³NBER as of 9/30/16. 4JPMorgan as of 6/30/16. The views contained in this report are those of IR+M and are based on information obtained by IR+M from sources that are believed to be reliable. This report is for informational purposes only and is not intended to provide specific advice, recommendations for, or projected returns of any particular IR+M product. No part of this material may be reproduced in any form, or referred to in any other publication, without express written permission from Income Research & Management.